Lactobacilli naturally present in the neonatal gut are believed to be beneficial for the human hosts and are investigated as potential probiotics. In this study, we aimed to characterize six Lactobacillus plantarum strains derived from the feces of a breast-fed infant, for the development of new probiotic cultures. Our attention was focused on L. plantarum in reason of the presence, within such species, of both pro-technological and probiotic strains, i.e., a combination of particular interest to design tailored probiotic starter cultures for developing countries. The bacterial isolates exhibiting lactobacilli-like phenotypic characteristics were identified as members of the L. plantarum group by 16S rRNA gene sequencing, and their diversity was evaluated by randomly amplified polymorphic DNA (RAPD) PCR patterns. The selected strains were screened for probiotic potential through in vitro tests. Firstly, bacterial survival was evaluated in an in vitro system simulating the human oro-gastrointestinal tract, using also milk as a carrier matrix. 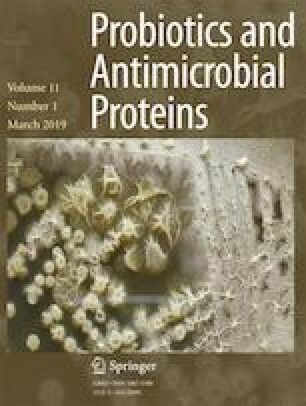 Besides, physiological traits such as antibiotic susceptibility, antimicrobial activity against selected enteric pathogens, and adhesion to abiotic surfaces and to gastric mucin were studied. Considering the resistance to simulated gastrointestinal digestion and the results from the biofilm and mucin adhesion tests, a strain-denominated L. plantarum LSC3 was selected for further evaluation of in vitro adhesion ability to intestinal mucosa and immunomodulatory activities. L. plantarum LSC3 was able to adhere efficiently to human enterocyte-like cells (Caco-2 cells), and decreased IL-8 transcription while increasing IL-10 mRNA level, as revealed by transcriptional analysis on LPS-stimulated human (THP-1) macrophages. Our results highlight that L. plantarum LSC3 fulfills major in vitro probiotic criteria as well as interesting immunostimulatory properties, and thus may be a promising candidate for further in vivo studies aiming at the development of novel probiotic starter cultures. The online version of this article ( https://doi.org/10.1007/s12602-018-9396-9) contains supplementary material, which is available to authorized users. Vittorio Capozzi was supported by Fondo di Sviluppo e Coesione 2007-2013—APQ Ricerca Regione Puglia “Programma regionale a sostegno della specializzazione intelligente e della sostenibilità sociale ed ambientale—FutureInResearch”. Pasquale Russo was supported by a grant of the Apulian Region in the framework of “Perform Tech (Puglia Emerging Food Technology)” project (practice code LPIJ9P2). This paper is dedicated to the memory of our friend and colleague Prof. Chekroun Abdallah. This article does not contain any studies with human or animal participants performed by any of the authors.